Illustrating on walls has been a form of expression that dates back to the beginning of human existence. The earliest form of cave paintings was created in the Franco-Cantabrian region around 40,000 years ago. At this time, the cave paintings were mostly outlines of hands, a process called finger sluting, and geometric shapes. As it developed, the paintings often included large animals such as bison, deer and horses. The animals were those hunted by humans, giving us a glimpse into the lives of the people who created them. These paintings help us to formulate what their lives may have consisted of. Additionally, people who existed during the time of the first cave paintings would reside within the very caves that they painted. This raises the question: why did they choose to paint the walls of their homes with their own story, which they undoubtedly already knew? Like their paintings, their motivation may be one of immortalization of themselves and their stories by imprinting parts of their lives as fixtures on the walls. Another interpretation may be that they wanted to make their space more beautiful, so they painted what they knew. As the the colloquialism goes - paint what you know. Like cave painting, graffiti artists and muralists create a image that depicts some facet of human life today. However, the artists of today usually create a more complex and technically difficult work. This piece will examine a variety of artists from different nations in an attempt to explore street artists’ desire to express themselves in such a pronounced space. Since art is commonly thought of as an expression of the self and/or the contemporary culture, we can surmise that the artists of the past and today have imprinted components of their own nation’s culture in their work. But as technology has advanced, we have had access to other nations’ cultures and histories. This series will examine and analyse various street artists of today in relation to their nation of origin. With the development and evolution of street art, it is important to understand which features are specific to particular countries, cities, and modes of thought for future understanding and classification and how it relates to its location or artist. This article will focus on the German artists ECB and KEF!. These two artists represent different lines of thought and style implementation, but they both experiment with way to evoke their messages and beliefs from their viewers. They intend to form connections with their viewers and to encourage deep thought through large scale wall painting. Before we examine ECB or Kef!, it is important to understand the street art has been a fixture on the walls, buildings, and bridges since before the Berlin Wall came down. Thierry Noir is claimed to be the first famous street artist to have painted on the Berlin Wall. This was a time of division, both literally and figuratively. When asked why he chose to paint this Berlin Wall, Thierry simply said, “Because it was new”.1 But in 2009, after the Wall was taken down, Thierry asked the local government to restore 1300 meters of the Wall to address issues caused over the years from weather, vandalism, and theft.2 As Thierry matured, his work became more complex and multidimensional. His growth as an artist represents a middle ground between the development of the cave paintings to street art today. He began with a simple representation of figures on a wall, solely because it was new. He now creates with purpose and intent behind his work. Many street artists today see the significance behind their work being so public and the influence they can wield if they utilize it properly. ECB and Kef! have used their ability to create influential art in the public sphere to their advantage as well. Hendrik Beikirch, commonly known as ECB, creates wall murals and interior pieces for galleries with a focus on documentary, portraiture, and fiction. He is known for his distinctly eye catching monochromatic style. He portrays anonymous figures in a quotidian, yet enchanting way. His finished works are either naturalistic or overtly abstract. The size and stark color contrasts of his figures are meant to invite his viewers to think about the individual and society. ECB’s studies of humanity are responses to the ubiquitous presence of digital media shown through a lense of photorealism. 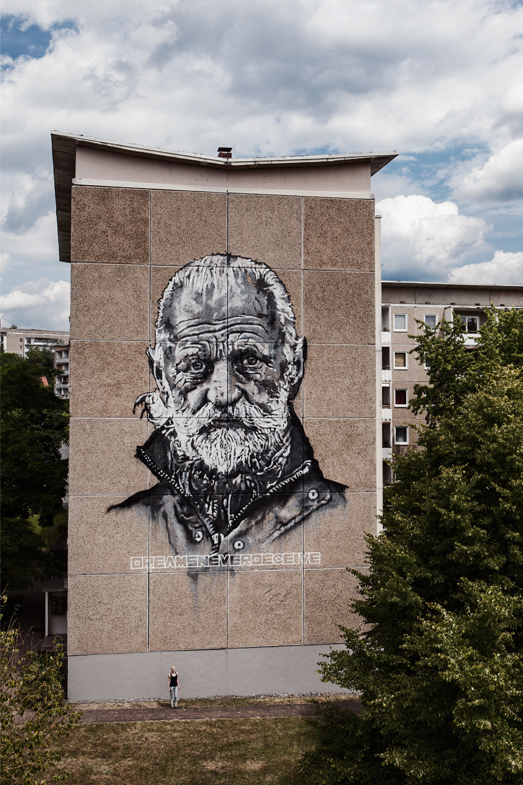 His works are described as companions with the landscape as opposed to interventions.3 His piece entitled Dreams Never Deceive,4 2014 depicts an older man on a building in Schmalkalden, Germany for the WallCom Urban festival, made with spray paint and emulsion paint on concrete. This man bears a weathered face and is clearly an older man - perhaps in his late 60’s. He also wears what may be a waterproof coat or attire for a factory worker. These features give the viewer a view into this man's life. He is one man and everyman due to the anonymity ECB applied to him, along with his working class appearance. This figure pays homage to the hard working blue collar men and women. Given Germany’s industrial driven economy in juxtaposition from destruction of past wars, the common man can be seen as someone such as this man; a man that has had a taxing and complex existence. Yet he stands out beyond the common man due to his size (shown in the photo with a man for reference) and the stark contrast implemented through ECB’s monochromatic style. He uses this style to emphasize the figure’s wrinkles, hair, and proud melancholy. By using anonymous figures and portraying them at such a large monochrome scale, ECB created a figure who represents a hard working man that we quite literally look up to, while simultaneously relating to him. In comparison to the cave paintings of our earlier ancestors, ECB clearly implements more technical talent as well as complex thought. But is what drives him similar to what drove the creation of the the cave paintings? Perhaps. ECB has depicted a man who seems to portray the larger part of the population. His melancholy expression is a reflection of the challenging life that accompanies the working class. But his old age implies his success as a person in today’s society. While his expression is hardened through the presence of wrinkles and a furrowed brow, his eyes seem sad, yet friendly. He gives the impression of a tired, slightly disgruntled grandfather who has seen and experienced a full life. Although ECB used the image of an anonymous man, he actually portrayed everyman. Which is very similar to what the cave painters did in the sense that they showed a clear facet of their daily lives. They chose to represent the animals they hunted and the hands of those who hunted. The roles portrayed in both types of wall paintings were indicative of the hard work that must be done in order to survive, even if completely different in almost every other capacity. ECB categorizes some of his other works as “fictional” due to his use of abstract representation of his chosen figures faces.5 Again, he chose anonymous subjects, but his abstract alterations are the product of his imagination. These works are meant to cause the viewer to question the surroundings and the conventions of portraiture. While there are still components of hyperrealism that he employs in his documentary/portraiture, he does not adhere to natural human proportions. Many of the examples that ECB categorizes as fictional are vastly different from each other. The level of abstraction often varies greatly from one work to another. The work to the right, titled it’s not years in life, it’s life in years (2011),6 is a fictional portrayal of an unknown man, created with spray paint and emulsion paint on the side of a building in Meerane, Germany. The abstraction in this work is subtle and shown mostly through the clear expression of geometric shapes and text on his forehead. It is unclear which lines and shapes are a part of the building and which are created by ECB. In contrast to this level of abstraction, this next piece, titled “dywa” (2010),7 is another fictional portrayal created with spray paint and emulsion paint on a wall in Ekaterinburg, Russia. This piece features a man, whose face is mirrored, looking at the viewer from a ¾ turn. His face is broken into pieces akin to a fragmented mirror. There is also distortion in his face, perhaps meant to portray the inverse effect of a fish eye lens due to the enlarged, stretched appearance. The name of the mural is repeated over and over in the shape of a triangle between the mirrored face, partially overlapping the figure’s cheeks. Both of these works are were created in towns with economies dependent upon the factories located there.8 & 9 Although they are located in different countries, ECB shows his proclivity for representing the working man - specifically factory workers. Although these two creations are dramatically different from each other, they are both adherent to the characteristics of ECB’s fictional pieces. Thinking back to the cave paintings yet again, this type of abstraction, clearly influenced by the human form, is less overtly indicative of a specific persona, and much more a piece meant to evoke reactions specific to its viewers. The figures mirrored, abstract face is an extension of the original practice of representation of what the painter knows, with the addition of introspective thought. The cave paintings were typically representations of the different facets of human life and experience at that time. Perhaps the intent only extended as far as human thought and introspection would allow at that time in mental and emotional development. Today, we are a species that prides itself on its self awareness and ability for complex thought. ECB’s fictions and portraits may both be seen as a complex extension and intentional complication of the original, more simplistic cave paintings. Simon Röhlen, better known as KEF!, takes a very different approach to wall painting from ECB. He implements a higher level of abstraction through a linear style with varying thickness and directionality of lines. He creates curving, botanical abstractions of harmonious shapes through connecting black lines. KEF! also often uses accents of bright colors that pop from the more intricate black details. He evokes a much more peaceful, hypnotic, and joyous reaction from his viewers, in comparison to ECB. ECB encouraged the viewer to think more critically of themself in a larger community through showcasing an anonymous, melancholy figure. KEF! inspires us to think about the more pleasant components in life. His style is directly influenced by nature and buddhist philosophy.10 Nature’s influence is shown through the abstract shapes, reminiscent of leaves from a vine or the petals of a flower. Buddhism’s influence is exhibited by the intended peaceful reaction his pieces evoke. He creates a colorful linear configuration that encourages his viewers to feel cheerful and to appreciate its simple beauty by putting us in a trance. His heavy use of line throughout his work pulls the viewer’s eyes around the painting. He creates a dynamic piece, which initially appears to be an overwhelming number of lines and vertices. But once the viewer focuses in on one point, the lines guide their eyes throughout the rest of the work. In an interview with I Support Street Art (ISSA), Kef! described his process as a natural progression that allows his work to authentically flow. To further facilitate this process, he told ISSA that he most often listens to ambient, hypnotic music, but on occasion, he will listen to industrial techno, which is shown via a much more rough and abrupt completed work.11 Multiple of Kef!’s more recent creations were projected onto the Altes Stadthaus in Berlin for the Berlin Festival of Lights in October of this year.12 The Altes Stadthaus is used by the senate, which speaks to Kef!’s desire to spread his Buddhist beliefs and joy to as far as possible. The location speaks to his desire for peace and love to permeate the government and influence their executive decisions. Although this piece is not as permanent as much of his other works, it was showcased in such a way to give it more influence and a broader audience. More typical representations of Kef!’s can be found all over the world. 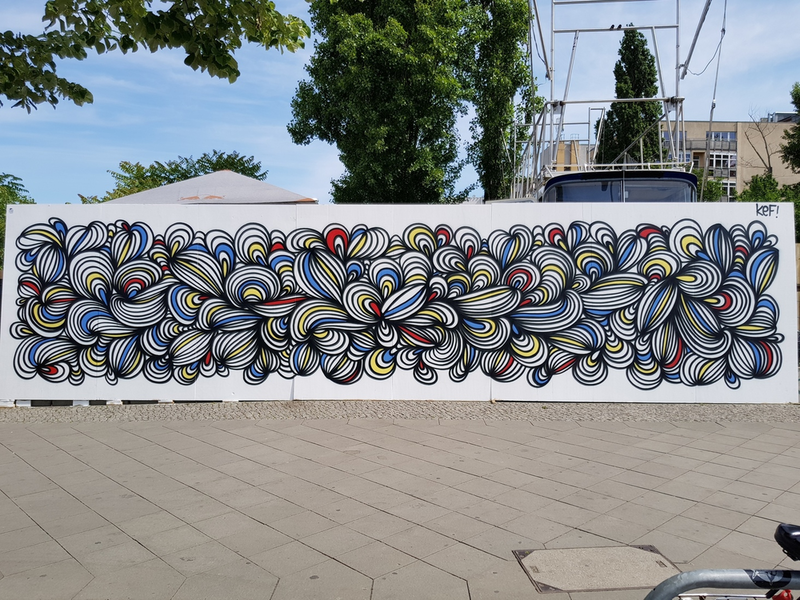 In Berlin, Germany, there is a mural festival at which Kef! created a three paneled wall with one of his more classic designs.13 This representation was amongst many others by varying street artists in an effort to further facilitate the growing interest in street art from both artists and viewers. The festival includes dance performers and musicians, with sponsorships from local galleries and vendors. 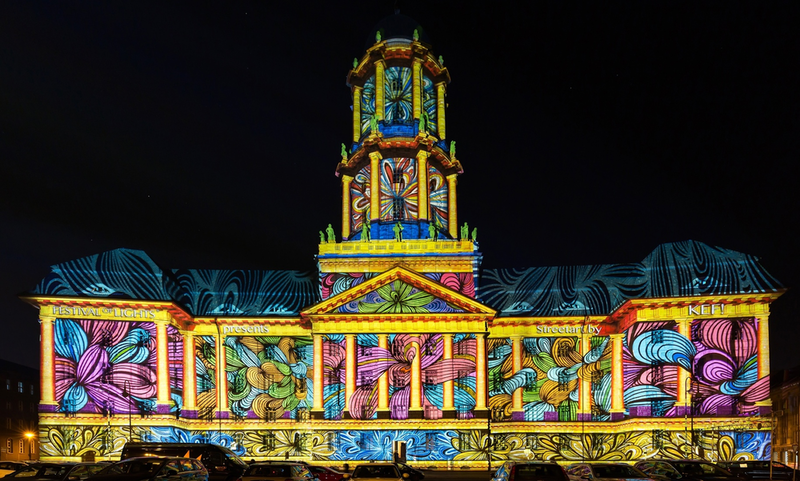 An environment like this attracts both art lovers and newcomers, which allows the street artists taking part in the festival to showcase their work to many more people than they otherwise would have, had their work solely been located on a random wall. Aligning Kef!’s designs with the original cave paintings is a bit more of a stretch than doing so with ECB’s. However, the idea of representing what the painter knows is still congruent in his works. As opposed to just painting images or representations of his quotidian habits, Kef! has chosen to show his beliefs and desire for the world to follow suit. His beliefs are what he knows to be true. The same can be said regarding the much less conceptual cave paintings. ECB and Kef! have formulated their own, individual styles and intended messages for their viewers, and have chosen street art as their avenue to the public. Although much more complex, their underlying goal was to show their viewers the world they live in (as they see and want it), which is precisely the message we have taken from the cave paintings of our ancestors. ECB and Kef! have impressed upon viewers their ideas and convictions through wall paintings, formulated from the very communities in which they are created. Burk, Jason. “Berlin Wall given a facelift as freedom painters return”, The Guardian. Snarkelis, Janis. “About.” hendrikbeikirch.com, 2010. Snarkelis, Jamis. “About.” hendrikbeikirch.com, 2010. Collaborators, ISSA. “KEF! Street Art with Spirituality and Harmony.” I Support Street Art, MIT and GPL, 2010. Madeline Keane has a BA in art history from Wesleyan University. She worked at the Philip Johnson Glass House in New Canaan, CT before her career in venture capital. She then assisted in opening a project based learning school called Hudson Lab School in Westchester, NY, followed by a professional soccer career abroad in both Iceland and Italy. Since her return, she has done research for Prehype, a venture capital incubator in Manhattan.